The 23rd annual College All-Star Game on August 10, 1956 featured the Cleveland Browns, defending NFL Champions for the second straight year, against a squad coached by Curly Lambeau, who had guided the All-Stars to a 30-27 upset win in the previous contest. The Browns, coached by Paul Brown, were again without QB Otto Graham, who retired for good after the 1955 NFL title game. George Ratterman, who started at quarterback in the previous year’s defeat, was again behind center. Cleveland was better prepared than when facing the All-Stars in ’55, however, and it would show. The All-Stars featured a lineup that included the reigning Heisman Trophy winner, HB Howard “Hopalong” Cassady from Ohio State, as well as future pro stars such as Michigan State QB Earl Morrall, halfbacks Lenny Moore of Penn State and Preston Carpenter from Arkansas (who had been drafted by the Browns), West Virginia guard Sam Huff, and SMU tackle Forrest Gregg. There were 75,000 fans in attendance at Soldier Field for the Friday night game. The All-Stars looked strong on offense as they took the opening kickoff and, with Earl Morrall behind center, got two first downs on an 11-yard pass completion to Navy end Ron Beagle and a ten-yard carry by the quarterback. Cassady ran for nine yards to put the All-Stars at the Cleveland 34. However, Morrall suffered an injury to his throwing hand and, on the next play, DHB Warren Lahr intercepted a pass by QB Jerry Reichow of Iowa in the end zone to snuff out the threat. It would be all downhill for the collegians, as they never again penetrated Cleveland territory for the remainder of the contest. Cleveland methodically moved 80 yards in 12 plays that concluded with George Ratterman passing to HB Fred “Curly” Morrison for a 13-yard touchdown. Lou Groza (pictured at top) added the extra point and the pro champs were up by 7-0. Early in the second quarter, the Browns reached the All-Star 25 but, after being backed up by a holding penalty, settled for a 47-yard Groza field goal (some sources show shorter distances on the field goals because, under the college rules that the game was played under, field goals were measured from the line of scrimmage rather than the spot of the kick). On the next Cleveland series, the Browns lined up for another field goal try but pulled a fake instead, with DB Tommy James carrying the ball. However, he came up two yards short of the necessary distance for a first down. James made up for it a short time later when he intercepted a pass that set up another Groza field goal, from 37 yards, just before the end of the first half. Cleveland led by 13-0 at the intermission. Dominating on defense, Cleveland kept it very conservative on offense, making for a dull display for the crowd. Even with Morrall’s return to action for the second half, the All-Stars could not mount a threat. Midway through the third quarter, the Browns had good starting field position due to a shanked punt. A successful Groza field goal try from short range was wiped out by a holding penalty, but he then connected from 31 yards. Shortly thereafter the collegians, trying to convert a fourth down, lost the ball when FB Don Schaefer fumbled and the Browns recovered at the All-Star 45. That led to a 34-yard field goal that made the score 19-0 heading into the final period. Early in the fourth quarter, Lenny Moore created some excitement with a 24-yard run for the All-Stars, but the Browns once again stifled the collegians on offense. One final touchdown came at the end of a 38-yard, seven-play series, with HB Gene Filipski running the last two yards to paydirt. It was set up when Preston Carpenter fumbled a punt and DE Jim Ray Smith recovered for the Browns. Groza’s successful PAT put the cap on a convincing 26-0 win. The Browns led in first downs (18 to 5) and ground out 191 yards on the ground. The All-Stars, who rushed for 121 yards, managed to complete only two of 10 pass attempts for 12 yards and two were intercepted. The All-Stars also fumbled the ball away three times while the Browns suffered no turnovers at all. Lou Groza’s 14 points, thanks to his four field goals and two extra points, represented the largest individual total since Don Hutson accumulated 19 in 1940. 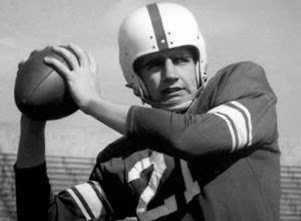 George Ratterman was successful on 7 of 14 passes for 84 yards and a touchdown and his understudy, Babe Parilli, completed one of four throws for four yards but rushed for 39 yards on seven carries. FB Ed Modzelewski led the ground attack, rushing for 76 yards on 21 carries. For the All-Stars, Earl Morrall (pictured above) completed one of four throws for 11 yards and Jerry Reichow managed one completion for one yard. Don Schaefer topped the collegians with 42 rushing yards on 11 carries while “Hopalong” Cassady, who was playing with an injured heel, was held to 21 yards on six attempts. Cleveland’s win put the pro champs ahead in the series by 14 to 7, with two ties. However, it didn’t herald another big year for the Browns. They lost four of their first five games on the way to a 5-7 finish, the first losing record in franchise history. 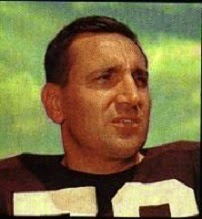 Earl Morrall spent his rookie season with the 49ers and would play for five other teams in a pro career that lasted 21 years. He would return to the College All-Star Game as a member of the Baltimore Colts in 1971.